By now, you should all be fully aware of the vast benefits that are involved with the installation of some top quality artificial grass. Not only does it look a lot better than the natural stuff, it’s also much easier to maintain and will continue to look fantastic regardless of what the weather is doing. By taking advantage of our services, you can provide yourself with an outdoor space to be proud of. 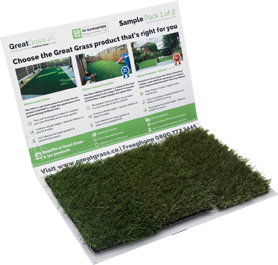 Our artificial grass products are incredibly popular with football pitches, exhibitions, beer gardens and, of course, residential lawns. However, they also have many other uses, some of which we’re sure you won’t have thought of. Such is the versatility and quality of the Great Grass products, our artificial grass by no means has to stop in your back yard, because it’s used for all manner of things. Anyone that watches the Masters or the Ryder Cup is probably fully aware of just how fantastic the grass looks at golfing events. Some golf fans will sit there wishing they had such a luscious-looking lawn at home- and now you can. Artificial grass can be used indoors, meaning that you can use it to create your very own luxury indoor putting green. Obviously, you’re going to need a fairly large spare room, but there’s no reason you can’t work on your handicap when the weather’s rubbish! This may sound a little strange, but any of you with pet reptiles should probably know that they love the bright green of artificial grass! So if anyone has a little lizard, snake or even a chameleon living in their home, then you might want to think about laying a small piece of artificial turf in the tank! Reptiles love the texture and feel of artificial turf- so go ahead and give them what they want! When it comes to using artificial grass, it’s fair to say that many people can get particularly artistic. Whether it’s covering a chair with green turf so that it blends in, or lining the fences with artificial grass to emphasis the greenery- people all over the country are making the most of our artificial grasses. Some homeowners will even use artificial grass as a way of hiding some unsightly aspects of the garden- such as the bins. Here at Great Grass, we love to see some creative uses of artificial grass and, if you’re interested in what we have to offer, then get in touch with our dedicated team today!